I love these colors together! 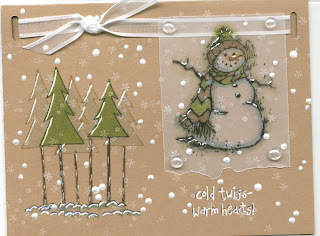 I did the snowman on vellum and colored the image on the back with my Copics (love them). The trees I stamped in Pallette Cognac and colored them with the light green Copics; then stamped the image again in black and colored them in a darker green Copics. A white gel pen was used to "pile" the snow on the trees and on the snowman. I stamped the snowflakes in white pigment and then used the 3-D paint to put dots on some of the snowflakes emphasizing them. The "film" ribbon is from Michaels. The sentiment is also stamped in white pigment and accented the letters with an ultra think pen tomake them stand out. Thank you visiting my page and come back to see me real soon.